The Oncomine Comprehensive Assay v3 is a targeted, next-generation sequencing (NGS) assay that enables the detection of relevant SNVs, CNVs, gene fusions, and indels from 161 unique genes to help inform drug discovery research and clinical trial research programs. It provides the reagents for library construction and four pools—two DNA and two RNA—of multiplex PCR primers for preparation of amplicon libraries from formalin-fixed paraffin embedded (FFPE) tumor samples. Designed to help you go from hundreds down to a few relevant cancer drivers, this assay is part of a comprehensive workflow that enables NGS data analysis from as little as 10 ng of nucleic acid per pool. 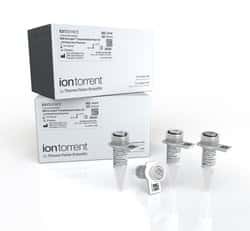 The assay is optimized for sequencing on the Ion GeneStudio S5 Systems with the Ion 540 Chip to enable up to 8 samples (7 samples and one no-template control) per run. When combined with Oncomine Reporter Software, you can create reports that align labels, guidelines, and clinical trials to your results so you can focus on key drivers of cancer in your research. The Oncomine Comprehensive Assay is part of an NGS workflow that helps researchers to filter variant results from hundreds to just a few key cancer driver variants. Enabled by Oncomine Informatics, this filtering, as well as the annotations from on-market labels, established guidelines (US-NCCN, US-FDA, EMSO, EMA), and global clinical trials, helps you contextualize and interpret findings to move toward the answers you need.